The greatest impact of mobile phone use on the environment is the sheer number of handsets that we get through on a worldwide basis. Currently, there could be as many as 5 billion mobile phones in current use all over the globe – but that number just represents our current phones. People everywhere have old phones in drawers, cupboards and just lying around – until they make it into the bin and go to landfill. Environmentalists started warning us of the potential for a mobile phone waste mountain several years ago. In 2006, a British newspaper article warned that around 1700 mobiles were being chucked out every hour in the UK alone. Since then, the pressure from mobile phone companies offering new and better handsets, different contracts, cash back and free gifts has done nothing to lessen our obsession with replacing mobiles. Today, the average mobile handset is considered redundant after about 18 months – even though it still may be in working order, it can be cast aside and relegated to become electronic waste. In developed countries, the problems are severe, but countries such as the USA, Australia, European member states and others have strict laws about recycling electronic equipment and are looking into ways to prevent mobiles ending up in landfill. Equally concerning is the rise in mobile phone use in middle income and developing countries, where environmental regulations about waste are not in place, or are not enforced. It was recently reported that families in Africa and India may live in a simple house without a toilet, but still have a mobile phone and a TV and satellite dish. Consumerism has created the demand for electronic possessions worldwide. 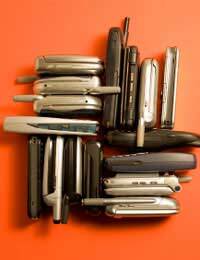 Throwing away old mobiles is environmentally destructive on several counts. First, the valuable resources that are contained in the phone are lost, including small amounts of very precious and rare raw materials such as the metals used in the chips in the phone. Materials used to make liquid crystal displays, and some of the rarer metals used, such as lithium, represent a real waste and have lead to a world shortage of some raw materials. Second, the carbon dioxide and other emissions that were used in its manufacture are more costly because the phone has been in use for such a short time. Third, some of the components in mobile phones are not biodegradable and some are actually very toxic, so will contribute to future problems in landfill sites. Metals commonly used in mobile handsets include mercury and lead, which are well known poisons. Allowing these to seep into groundwater and into the domestic water supply could create a public health crisis. In the last three or four years, it has become more possible and more likely that we will recycle our old handsets. Many different companies have set up to offer cash incentives for returning your mobile for recycling. For people who have a 12-month contract, perhaps on a work phone, replacing the handset after a year can leave them with a very attractive second hand phone that maybe worth £150. Charities such as Oxfam have also started to take old mobiles – any money that they can obtain from offering the mobile for recycling then benefit the charity. Some charities also organise used handsets to be sent to the developing world, where they can be used by people without the resources to buy new mobile phones. There is no agreement about what can be done to avoid waste from mobiles increasing further. Recycling and handing in old handsets can help – as can gritting your teeth and keeping your mobile for longer than 18 months. Even two years would be a help, three would be better. In the UK, the government is also looking into ways to prevent people throwing mobiles in the household rubbish; in the future we could see laws that prevent you buying a mobile unless you hand an old one in, but just how this will work in practice has not yet been finalised.